Precious gold jewellery is one of life’s little luxuries that few of us would want to be without. But what if you are the owner of some unwanted pieces – perhaps through inheritance or as a gift that didn’t quite hit the spot? Fashion styles and tastes change all the time, and that goes for bracelets and bangles as well as blouses and blazers. You may have been given Auntie Beryl’s old gold necklace and kept it in a safe place for years, with no intention of ever wearing it simply because it’s no longer fashionable. Don’t worry, you’re not the only one. If pressed, many of us would sheepishly admit to having a motley collection of fine yet untrendy gold rings, chains or bracelets collecting dust in a jewellery box at the back of the lingerie drawer. So, have you ever thought about releasing their value? What’s the price of gold? If you’re thinking about parting with your unwanted gold necklaces or rings, the first question you should ask yourself is whether now is the best time to sell. Clearly, if you’ve already made plans for what to do with the proceeds and need the funds straight away, this is not an option. Otherwise, spend a bit of time familiarising yourself with gold prices. Similar to oil or coffee, gold is a commodity that’s traded on the international market. General market economy rules of supply and demand dictate that the price can go up or down at any given time. The global price for (melted down) gold is published daily and you can use online resources such as Goldprice or Kitco to check the current price now. Generally speaking, gold prices rise when times are hard, so it pays to keep an eye on economic forecasts before making the decision to sell. In actual fact, the price of gold has benefited from a steep rise between 2005 and 2011, meaning your old jewellery may be worth substantially more than you think. Who is a reputable buyer? 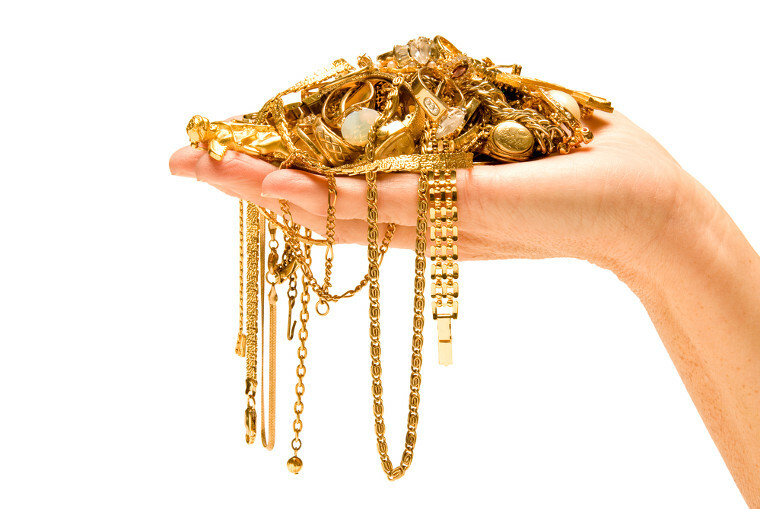 Companies offering to buy old gold seem to be everywhere these days – from pawnbrokers and cash-for-gold businesses to jewellery shops and online buyers, there’s certainly no shortage of interest in taking your unwanted gold chains, pendants and bracelets off your hands. All buyers will be happy to give you a valuation for your precious items, but the price offered may vary widely. And while using a specialist cash-for-gold company may seem the most convenient way, be careful: research has shown that they’re unlikely to get you the best deal. Alternatively, you can sell your gold independently, either to a high street jeweller or through an online trading website such as eBay. It may take a little more effort on your part but there’s a good chance that you will get a better price. Gold buyers tend to be interested in the value of the precious metal alone, and if the jewellery you are planning to sell genuinely falls into the ‘scrap metal’ category – perhaps the pieces are broken – then all well and good. Make sure you remove any precious stones from rings, necklaces etc before you hand them over, as your buyer may not give you any money for them at all. It is also important to bear in mind that fine pieces from renowned jewellery designers and high end retailers such as Tiffany are worth much more than just the sum of their parts. As a collectors’ item, a Cartier ring can fetch huge amounts, especially if it’s old. If you suspect that any items you own may have more value than just the gold in them, or that they could be antique or of interest to collectors, it’s essential that you get a professional assessment from a reputable jewellery expert. The same goes for old coins, medals and other gold keepsakes – if in doubt, have them valued by a specialist. They may be worth far more than you would ever get from a cash-for-gold company. Finally, before you cash in Grandma’s old bracelet or Dad’s gold signet ring, here’s an idea worth exploring. If your gold pieces have sentimental value but never get worn because they’re just not your style, why not give a thought to having them remodelled. Using the expertise of a jewellery designer, your unwanted gold items can be turned into new, exciting pieces that you will want to wear. Book a consultation with a goldsmith whose work you admire and be inspired by their ideas for a new bracelet or necklace, earrings or ring made just for you. And if your old jewellery contains diamonds or other gems, these can be reset into new pieces too. It’s a beautiful way to preserve a memory, and makes for a cost-effective way to own a uniquely designed piece of jewellery that you will love for years to come.